Since GERD is characterized by chest pain, it is often confused with the pain associated with an angina attack or heart problems. 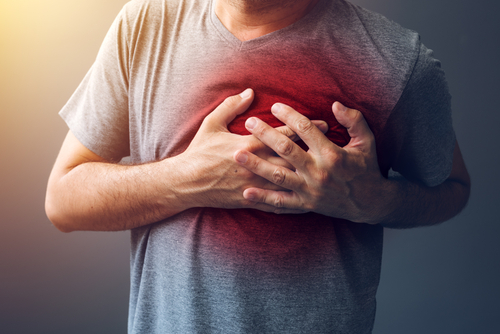 If you are unable to tell the difference and are suffering with severe chest pain, it is important to speak to your emergency doctor as soon as possible to rule out something serious. Better known as acid reflux disease or heartburn, GERD (gastroesophageal reflux disease) is a painful and sometimes debilitating digestive condition that is characterized by the movement of stomach contents back up into the esophagus. This happens in part because the lower esophageal sphincter (LES), the circular muscle dividing the esophagus and the stomach, fails to contract which then allows stomach contents to flow retrograde, back up into the esophagus. Since the stomach contains acids designed to break down the food we eat, it is these acids that slip back into the esophagus, burning the delicate soft tissues that are not designed to withstand it and causing us pain. What causes the LES to fail to close properly? Larger meals that cause the stomach to stretch, temporarily altering the way in which the LES works. Consuming particular foods or drinks. Many people find that alcohol, carbonated drinks, or any food with caffeine (chocolate, coffee) can trigger episodes of acid reflux. Presence of a hiatal hernia, which is where a part of your stomach pushes upward through the diaphragm, affecting how the LES closes. By far the most common symptom of GERD is burning chest pain that tends to begin behind the breast bone and moves upwards towards the neck and throat. In some cases, particularly if you have been laying down, you may even feel the presence of acid in the back of your throat and mouth. The pain associated with GERD normally gets worse after eating, and again if you lay flat or do any exercise shortly after a meal. Some patients with GERD find that they have a bitter taste in their mouth, and it can even affect their breathing. While it is possible to manage episodes of GERD and make changes to reduce the number that you have, many people live with the effects for far longer than they need to before seeking help. Unfortunately, the recurrent presence of stomach acids in the esophagus can cause damage including a condition called esophagitis, which is the inflammation of the esophagus or even lead to the development of an esophageal ulcer. Some patients will also experience bleeding from the esophagus, which can eventually cause anemia. Anyone who has anemia, in addition, may need to be worked up for having a hiatal hernia. Scar tissue can develop in the esophagus, causing it to narrow or even shorten. Barrett’s esophagus. This condition occurs when the cells in the esophagus change over time, becoming more like the cells that are in your stomach. Unfortunately, these cell changes can also lead to the development of cancer of the esophagus. If these changes alone are not providing sufficient relief from your GERD symptoms, your doctor may prescribe proton pump inhibitors. These work by reducing the amount of acid produced by your stomach, thus reducing the severity of your symptoms. There are also some oral medications that help to neutralize acids in the esophagus and stomach including antacids which can be bought over the counter. It is important to note that treatment with strong antacids (proton pump inhibitors – “PPI”) does not cure or treat the reflux: it just neutralizes the acid. Finally, in severe cases of the condition, it may be necessary for your doctor to refer you for surgery to improve the function of the LES. This is known as fundoplication and works by wrapping the upper part of the stomach around the lower part of the esophagus so that the sphincter is strengthened. Paradoxically, the best surgical results and the most appropriate surgical candidates, are the ones who respond to PPI's. You may need several other tests prior to surgical consideration. You don’t need to live with the pain and effects of GERD. Speak to our experienced and professional team to schedule your no-obligation appointment to discuss your case in confidentiality.